CSPN is dedicated to advancing scholarship on the Pacific Northwest and North American West. We support research, teaching, and public programs that promote knowledge on the peoples and issues that have shaped the Northwest. Pacific Northwest Quarterly is the leading scholarly journal devoted to the history and culture of the northwestern United States, including Alaska, and western Canada. Announcement: The Center for the Study of the Pacific Northwest has a new website! Please visit our new website at https://depts.washington.edu/cspn/. All of the original website's features have been retained on the new website and more have been added. The original CSPN website will no longer be updated, but will continue to exist in its archived state. For questions, please feel free to contact us at cspn@uw.edu. 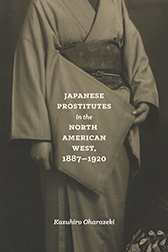 This compelling study of a previously overlooked vice industry explores the larger structural forces that led to the growth of prostitution in Japan, the Pacific region, and the North American West at the turn of the twentieth century. Combining very personal accounts with never before examined Japanese sources, historian Kazuhiro Oharazeki traces these women's transnational journeys from their origins in Japan to their arrival in Pacific Coast cities. He analyzes their responses to the oppression they faced from pimps and customers, as well as the opposition they faced from American social reformers and Japanese American community leaders. Despite their difficult circumstances, Oharazeki finds, some women were able to parlay their experience into better jobs and lives in America. Though that wasn't always the case, their mere presence here nonetheless paved the way for other Japanese women to come to America and enter the workforce in more acceptable ways. By focusing on this "invisible" underground economy, Japanese Prostitutes in the North American West sheds new light on Japanese American immigration and labor histories and opens a fascinating window into the development of the American West. James Ellis was frustrated. It was the mid-1960s, and Seattle was poised for growth. Boeing was rapidly expanding. The successful 1962 Seattle world’s fair had given the city a jolt of energy and greater confidence. By 1965 forecasters were predicting that King County’s population might double to two million in 20 years. The most optimistic economists thought the state could gain 60,000 jobs every year, most of them along the newly completed segment of Interstate 5 running between Tacoma and Everett through Seattle. Ellis fretted that the region was doing little to prepare for growth. In Seattle a weak-mayor–strong-council city government had sapped municipal initiative for years. Even as they made mild attempts at reform, Mayor Dorm Braman and the Seattle City Council acted like risk-averse investors when faced with any significant expenditures. In addition, King County’s government needed streamlining. We are pleased to announce that back issues of Pacific Northwest Quarterly are now available online through JSTOR, a not-for-profit digital archive containing more than 1,000 academic journals and other scholarly content. If you belong to an institution that subscribes to this collection, you can access the publication directly at www.jstor.org. You will be able to search, browse, download, and print the full-text PDF versions of all articles in back issues of PNQ, from its first year of publication in 1906 through early 2009. 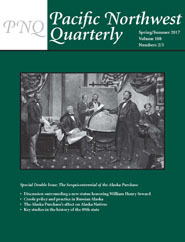 Please note: you may still view and download full-text versions of articles from all 26 volumes of Washington Historical Quarterly for free on the University of Washington Libraries website, https://digital.lib.washington.edu/ojs/index.php/WHQ. Issues from the last few years are not available on JSTOR. We have chosen to exclude our current material from the archives to help ensure PNQ's continued economic success. To order articles from the last five years, or if you do not belong to an institution that participates in JSTOR, please submit an order electronically on our website at http://www.cspn.washington.edu/PNQ/Order.html, or find an order form in your copy of the journal to be submitted by mail. LAWS includes more than 200 separate collections of labor-related materials. In volume, the collections exceed 3,000 cubic feet of documents, photographs, and other archival material. In volume, size, and scope, LAWS is one of the largest repositories of labor history in the United States.